Charles Darwin described 50 emotional states, such as anxiety, fear, embarrassment and guilt, in his book The Expression of Emotions in Man and Animals, written in 1872. Darwin’s descriptions were used by a Pixar animator Matt Jones to sketch what each emotional state looks like. 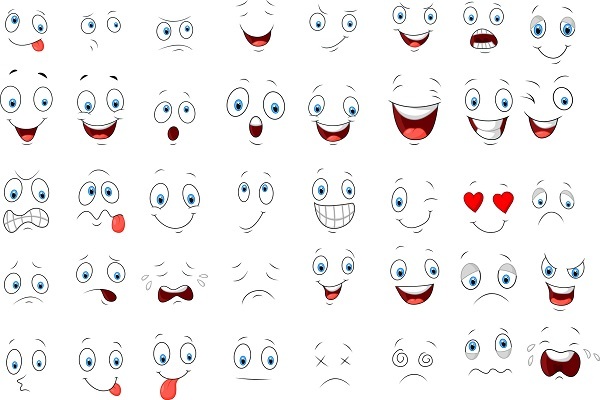 Jones’ sketches eventually morphed into the 16 emoticons we recognize today on Facebook. According to Dacher Keltner, billions of emoticons are send and received each day, and they’ve become the most widely used form of non-verbal communication. Keltner’s presentation was part of the symposium “Data 2.0: Big Data Insights Into Emotion, Altruism, Friendship, Happiness and Health,” featured at SPSP’s 16th Annual Convention in Long Beach, California. Studies on Facebook’s emoticons have shown that the expressions are recognizable across many different countries. The degree that the emoticons are recognized effects how often they’re used; the more identifiable the emotion is, the more often the emoticon is used across the globe. Researchers have been able to see how often emoticons are sent and received on Facebook, and they’ve used the data to create maps of where emoticons are used most often. Countries that rate highly in life satisfaction and have longer life expectancies, also have the greatest variety in emoticon usage, Keltner says. The maps illustrate that the Mediterranean region is where the most love emoticons are sent and received, and shows that the U.S uses fewer sympathy emoticons than Canada. The U.S. has a high volume of awe emoticons that are sent and received. Looking at prosocial behaviors can also shed light on how friendships are made. Aleksandr Kogan of the University of Cambridge discussed new research during his presentation on the effect social class and altruism has on social ties, and how utilizing Facebook data assisted in looking at those effects. “We know that social ties are fundamental for happiness and well-being, quality of life, disease resistance. And we know social ties are important to status and social hierarchy. As social psychologists, we all appreciate the importance of social ties. So what drives people to form them?,” Kogan asked the audience. Proximity has historically been an important factor, since we’re more likely to make friends with people that are nearby. But proximity is becoming a less important factor with the prevalence of online interactions. With that in mind, Kogan and his colleagues looked at two other factors: status (income), and prosociality (altruism). A collaboration with Facebook provided data on over 250 regions, over 1 billion users, and around 170 billion friendships. The researchers were interested in looking at trends of friendship requests across countries. A country’s GDP was used as a measurement of overall status and wealth. On a global scale, wealthier countries tend to receive more friendship requests. For instance, the data showed that more friendship requests flow from Russia to the U.S., and Russia’s GDP is much lower than the U.S. This trend was illustrated consistently across all of the countries included in the study. In general, if you live in a country with a higher GDP, you’re receiving more friendship requests. In another study, the researchers looked at prosociality by looking at whether or not individuals donate to charity. The study found that both donating and income correlate with the number of friendship requests an individual receives. Data shows that if an individual’s income is low, altruism is positively tied to the number of friendships. But that effect isn’t there for higher income individuals, suggesting that altruism is only a predictor for individuals who don’t have status and wealth to benefit them. At a country-wide scale, the data shows that countries that have more individuals who donate to charity also have more friends on Facebook. The effect was only present for countries with lower GDPs, which is consistent with the individual-scale data. The results highlight how low-income and high-income individuals have different pathways to making friends, and it’s not just location that plays a significant role.